Every year at Christmas, I get tired of your standard Christmas cookies. Don’t get me wrong, I’m not a cyborg or something, I still love cookies but I just find that Christmas cookies get boring and I crave a little something different. 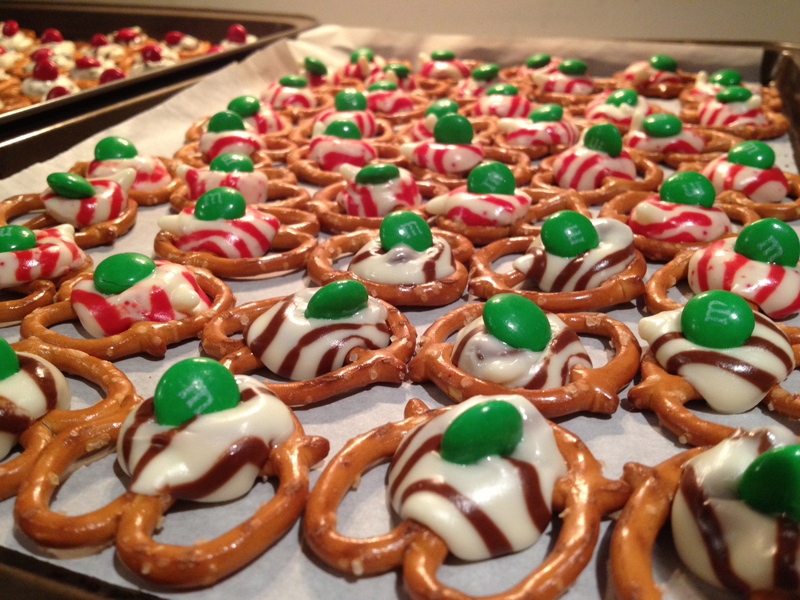 I tend to stick to really simple desserts to give as gifts such as fudge and these little pretzel candies that are truly awesome. I mean I love to cook and I love the kitchen but the holidays often become so busy and when you add way too much to your plate, it limits the amount of time you get to spend with friends and family and often results in high stress which i’m not really a fan of. I always remember those ‘Turtle’ commercials at Christmas time in the 1980’s and the catchy little jingle ‘I love pecans and caramel too, I love chocolate oh yes I do, that’s why…I love turtles. Turtles Turtles ra ra ra, Turtles, Turtles ha ha ha…mmmm I love Turtles’ . My sister in law Karen made these a while back for a Christmas open house and when I asked her about them…i just about fell over at how easy these were! They were wicked delicious too! Seriously, I love it when something tastes great and is easy to make…it’s the like the kitchen gods got together and went…’ya, let’s let them have this one’. Place in the oven for a few minutes. Watch them like a hawk!! You will know its time to take them out when the chocolate becomes shiny. 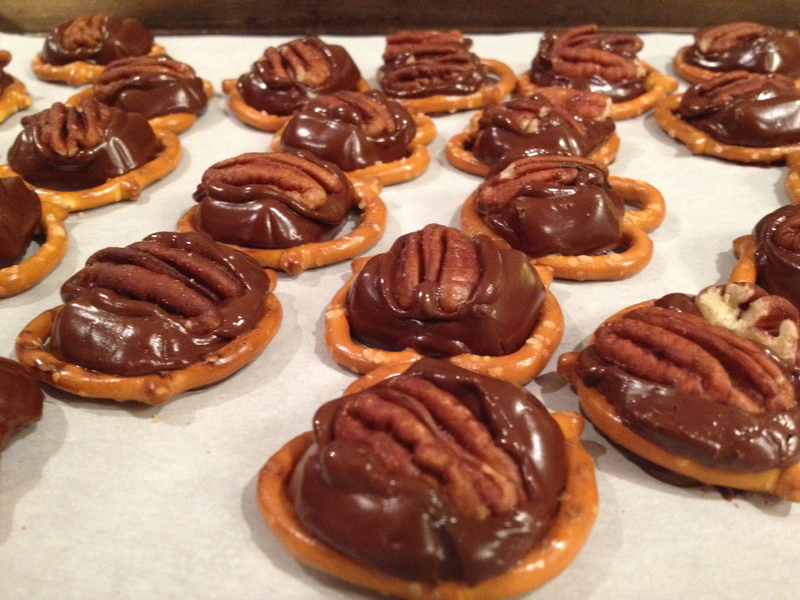 Take the cookie sheet out of the oven and press a pecan on top of each semi melted reisen. Watch your fingers and don’t use hulk strength or you will burn yourself. *You need to work fairly quick here otherwise the reisens will cool and it will be hard to get the pecan in there. Pack those pretzels up in a cute little Christmas Tin and you will show up to any party looking like a domestic goddess! Other variations of these kind of desserts can be made by substituting a Hershey Hug, you know the ones that are both white and milk chocolate or at Christmas they have the peppermint ones that are white and red? Instead of the pecan, just put a festive coloured M&M on top and you got yourself an eye popping little gift again. If you don’t like mint…do not, I repeat, do not under any circumstance put the peppermint ones next to anything or you just genetically modified every single treat in your Christmas tin. Again you will go from hero to zero instantaneously. You could blame it on that creepy little elf for doing something so naughty but really your snooty aunt will know what really happened. Hope you guys enjoy this super duper easy dessert. It’s perfect for the busy holiday season!